Russian Festival Matryoshka 2010 will take place at the amazing, 16,000 capacity, Kingswood Music Theatre at Canada's Wonderland. Canada's Wonderland is Canada's premier theme park and features over 200 attractions, more than 65 thrill rides and North America's greastest variety of roller costers and Splash Works, a 20 acre water park. All regular Canada's Wonderland rides and attractions, plus a full day of Russian and Eastern European entertainment and contests is included in the festival admission price! Find out where to buy tickets. 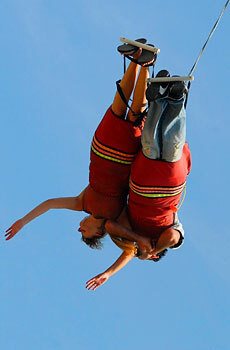 Canada's Wonderland is located just minutes north of Toronto off Highway 400 and just 10 minutes north of Highway 401. Exit at Rutherford Road if heading north or south on Highway 400. By Public Transit, the park is accessible view the #60 Wonderland Express "GO" buses run regularly from Yorkdale and York Mills subway stations. Visit the GO website for details. York Region Transit offers several routes to Canada's Wonderland. YRT Routes 4 and 20, as well as TTC Route 165A operate directly into the park. Visit the YRT website for details. 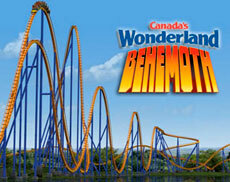 Visit Canada's Wonderland's website for further information. Planet Snoopy is the Place to be! 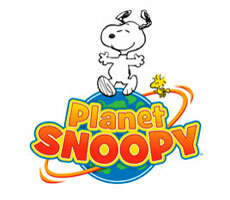 New for 2010 - Planet Snoopy! The world’s most popular beagle, Snoopy, has a new home in 2010 at Canada's Wonderland! With three brand new rides to take kids’ round and round and up and down, the whole family can play together this summer. An all new ice show is a chance to watch Snoopy and the gang spin, jump and twirl. Then cap off a perfect day in the park with a hug from Snoopy, Charlie Brown, Lucy and their friends! Visit the Planet Snoopy website for more information. New for 2008 - Canada's biggest, fastest and tallest roller coaster ever! Just a few minutes from the Russian Festival Matryoshka grounds! Don't miss it! Visit the Behemoth website for more information. 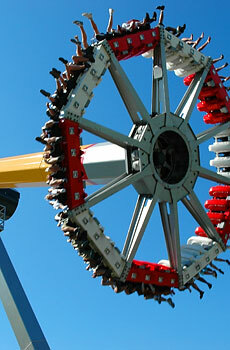 Canada's Wonderland is the home to the most exhilarating collection of rides and roller coasters in all of Canada! With Canada's Longest Wooden Coaster - The Mighty Canadian Minebuster, Canada's First Inverted Coaster - Top Gun and Canada's Only Flying Coaster - Tomb Raider: The Ride, North America's largest variety of coasters can be found here! If roller coasters aren't your game, test your level of thrill being spun 360 degrees on Cliffhanger, free falling 230 feet on Drop Zone, or be courageous enough to catch some 120 foot hang time on Psyclone. For guests who prefer milder thrills, a variety of relaxing rides await you. Every member of you family is sure to find one that is just right for them. From Carousel's, Train Rides and Swan Lake - milder thrills await! Where else can kids hang out and play with superstars like Dora the Explorer, Sponge Bob Square Pants, Scooby Doo and The Backyardagins then at Canada's Wonderland! The park features three areas just for kids including Nickelodeon Central, Kidzville and Hanna-Barbera Land. It's showtime every day at Canada's Wonderland! With two award-winning shows, the return of a Nickelodeon superstar, dazzling dives and gymnastics shows and characters galore - Canada's Wonderland is the place for fabulous live entertainment! 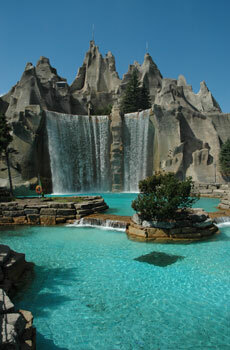 Canada's Wonderland is your Splash Headquarters for the summer! With Whitewater Bay - Canada's Largest Wave pool, Lazy River, water slides galore - there's something for everyone. If you are looking for a fulfilling meal or just a nice light snack to give you that energy boost for your next adventure, you will find plenty of food options here at Canada's Wonderland! From sit down restaurants to snack carts - appetites can be fulfilled everywhere! Shops are located throughout the park, filled with souvenirs, film, clothing and toys.